As a mark of respect to Grainne R.I.P. our U21 football match and the parish league finals were all called off, they will be re fixed at a later date, we will let you know as soon as. 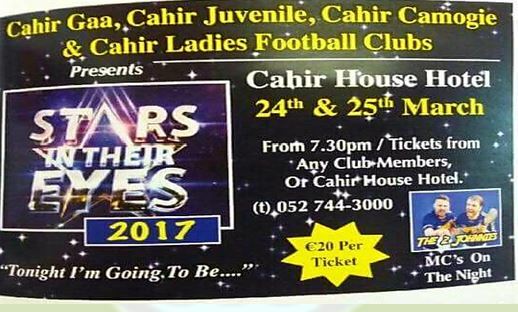 After the very successful Cahir Strictly Come Dancing last year, Cahir GAA Club decided to put on another show this year something a bit different to the one last year, we have in place a committee to overlook the project and are hard at work to make it as good as last year, all the acts are rehearsing night and day, as you can see from the poster the aim of the show is, a person or group comes up on stage and performs a work by a famous artist by dressing up as that famous act and sing and dance to that act's song, (after getting a sneak preview it is pretty good), we will give you more details of the acts in the coming weeks, remember last year's show was sold out quickly so make sure you buy your tickets early, they can be got from most club members and Cahir House Hotel at a cost of €20 each, so remember the dates 25th and 26th of March. Hard luck to our club man Liam Casey and his team mates from UCD, who were trying to make it back to back wins in the Sigerson Cup final last Saturday but wasn't to be, head up Liam great to see a club man on that team, (but you have your first medal not too many around here with one of them) well done. Well done to our hurlers who had a win over Waterford, also to our ladies football team (especially our club girls on that panel) who had a great win over Down last Sunday. Our representatives were E. Buckley, A. McCarthy, A. Moloney, R. Howard and R. O'Donnell well Done Ladies.